For Immediate Release: Posted On 3/25/2015 By Industrial Magnetics, Inc.
Industrial Magnetics Inc.(IMI) recently made their new, Max-Attach™ Polymagnet® line available to order from their website. 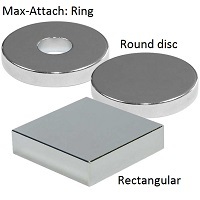 Polymagnets are multi-pole, encoded magnets that contain small magnetic elements called maxels. Each Polymagnet is imprinted with a pattern of maxels (magnetic fields), which are tailored to deliver stronger, safer and entirely new magnet functions not possible with conventional magnets. The Max-Attach Polymagnet line offers a significant advantage when used for standard magnetic attachment applications. Since their strength is concentrated near the face of the magnet, it not only increases the attachment force to more than double that of a conventional magnet, but it also reduces the risk to magnetically sensitive electronics or the accidental attraction to nearby metal or other magnets. Available in 28 different round, ring & rectangular sizes ranging from 8 lbs. to 96 lbs. of holding force, the Max-Attach Polymagnets can be purchased from the company’s website at http://bit.ly/Max_Attach.